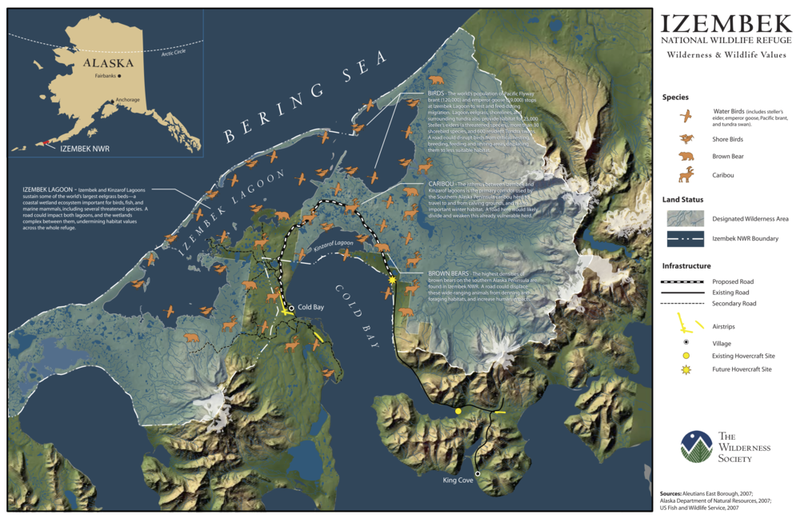 The Trump administration is trying to allow a 12-mile road through the Izembek National Wildlife Refuge and wilderness area in Alaska (Map 1). The protracted battle for the Izembek is now before a US District Court judge. At stake is whether the designations of national wildlife refuge and wilderness actually mean anything, at least in Alaska and/or under a Trump administration. Map 1. National wildlife refuges in Alaska. Izembek (lower center on map) is the smallest in size but not in ecological importance.Source: US Fish and Wildlife Service. Between the Pacific Ocean and the Bering Sea, where the Alaska Peninsula ends and the Aleutian Islands begin, lies the 320,893-acre Izembek National Wildlife Refuge. Ninety-six percent (307,982 acres) of the Izembek is further protected as the Izembek Wilderness. It’s not easy to visit the Izembek. After you get to Anchorage, you can drive south to Homer and catch the Alaska Marine Ferry, and you’ll be there in just fifty hours. Alternatively, you can take the daily 618-mile “commuter” flight from Anchorage, which can set you back a grand for a round trip, even though the flight is heavily subsidized by the federal government’s Essential Air Service program. The city of Cold Bay (pop. 108) exists because of a 10,000-foot-long paved runway built by the Army in World War II. After the school closed in 2015, the population declined as families moved to find education for their kids. Across Cold Bay is the cannery town of King Cove (pop. 989), which has a state-owned 3,500-foot-long gravel runway. Cold Bay’s economy is driven by government workers and King Cove’s by fishing and fish-processing jobs. Like Cold Bay, King Cove is organized as a city, but more important, it is the most populated portion of the King Cove Corporation (KCC) holdings, a unique form of ownership and government imposed by the federal government as part of settling the land claims of Alaska’s first residents. While there are some local roads in and around both towns, there is no road between them. Separating these two Alaska towns is a national wildlife refuge and wilderness that is one of the most important refuges for wildlife in the world, and that’s the rub (Map 2). Map 2. The Izembek National Wildlife Refuge and Wilderness, shown with annotations of important concentrations of water birds, shorebirds, brown bears, and caribou, and the route of the proposed road (click on source for a larger image). Source: The Wilderness Society. 4. To protect water quality and quantity. In 1986, Izembek was designated a Wetland of International Importance (also known as a Ramsar Site) because of its unique ecology, large eelgrass beds, and the importance of the area to migratory birds. Alas, the designation, awarded by the Ramsar International Convention (named after the city in Iran in which it was adopted) is merely one of international recognition and confers a national promise to protect the site. No consequences for not protecting the site are specified in the international agreement. The Izembek may be Alaska’s smallest national wildlife refuge, but its arrangement of shallow bays, wetlands, lagoons, and uplands of rolling tundra, sand dunes, and steep mountains makes it ecologically unique. The tides, ice, and sea conditions on the Bearing Sea to the north and the Gulf of Alaska to the south do not mirror one another. Wildlife can choose the conditions that work best for them at various times of the year. The Izembek Lagoon on the Bering Sea side is one of the world’s largest eelgrass beds, vital for hundreds of thousands of waterfowl. The Kinzarof Lagoon, on the Gulf side, also has vast eelgrass beds. The Izembek eelgrass beds support more than 98 percent of the world’s population of Pacific black brant (Figure 1 and Map 3). The eelgrass beds are also nurseries for salmon and other fish, and provide year-round habitat for sea otters and other marine species. Figure 1. A Pacific black brant (Branta bernicla nigricans). Source: U.S. Geological Survey. Other species of note include the tundra swan (which has experienced massive declines in the last three decades), the emperor goose (among the rarest and most imperiled goose species on Earth), Steller’s eider (listed under the Endangered Species Act as threatened), the northern sea lion, and Stellar sea lion. All these species and more are dependent upon a narrow isthmus that will be bisected by the proposed road. King Cove is a fishing town. While some local residents fish, up to five hundred nonresidents (mostly Filipinos) work in the Peter Pan Seafoods cannery. The residents of King Cove would like a road through the Izembek Refuge so they can drive to the 10,000-foot-long paved runway in Cold Bay. They claim the road is necessary for medical emergencies, as relying on a small plane to get to Cold Bay to get a larger plane to get to Anchorage is unreliable. It wouldn’t hurt that they could also drive to the Cold Bay Airport for nonemergency situations. It really wouldn’t hurt Peter Pan Seafoods if they could drive fresh product to Cold Bay for export instead of having to put it on a boat to the Cold Bay dock and then truck it to the Cold Bay Airport. Although viable alternatives to a road exist, these alternatives have been consistently rejected or abandoned by road proponents. Congress has previously sought to address the legitimate concerns of health and safety raised by King Cove residents. In 1999, it gave $37.5 million ($57.5 million in today’s dollars or $58,139.53 per King Cove resident) to purchase a hovercraft to travel between King Cove and Cold Bay, construct a road to a hovercraft terminal, and improve the King Cove airstrip and the King Cove Health Clinic. From 2007 to 2010, the hovercraft operated and performed all requested medical evacuations in almost all weather conditions. However, the locals discontinued hovercraft operations in 2010, citing maintenance costs and reliability concerns. They sold the hovercraft but didn’t return any money to the federal government. The thing is, a road is no better solution than a hovercraft because when the weather is bad for a hovercraft run across Cold Bay to the Cold Bay Airport for evacuation, it also tends to be bad for driving any road and flying out of Cold Bay. Though in a maritime climate zone, King Cove is at 55°N latitude, where the temperatures average 25 to 55°F, with extremes of –9 to 76°F. Because of the risk of hazardous weather, it is the wise custom of Cold Bay mothers-to-be to evacuate to Anchorage a month before their due dates. The Fish and Wildlife Service considered and rejected the proposed road in the early 1980s, 1996, 1998, and 2013. The 2013 review, by Interior Secretary Sally Jewell, was required under an act of Congress enacted into law in 2009. Congress wouldn’t pass a bill introduced by the Alaska delegation to just flat approve the road, but it did direct the interior secretary to take a hard and fair look at the proposal. She did. She found that the impacts would extend far beyond the relatively narrow road corridor and would have “profound and adverse effects on wildlife use and habitats on the narrow isthmus.” Increased human traffic and noise, changed hydrology of the wetlands, pollution runoff, and introduced contaminants and invasive species would despoil the isthmus. Jewell further found that trashing the Izembek would not be in the national interest and would not respect the purposes for which the refuge was established. And finally, she found that aside from the road, there were other current and optional modes of transportation available to address emergency medical transportation and pledged to work to implement them. KCC and the State of Alaska challenged Jewell’s decision, but it was upheld by the US District Court judge in Alaska. An appeal to the US Ninth Circuit Court of Appeals was filed by the road’s proponents but was later voluntarily dismissed. In January 2018, Interior Secretary Ryan Zinke signed an exchange agreement with KCC to trade ~500 acres within the refuge and wilderness for a to-be-specified acreage of KCC lands necessary to equalize the market value of the exchange, to allow building the road. In addition, KCC is tossing in 5,430 acres of its land within the Izembek and adjacent Alaska Peninsula NWRs. To compensate, KCC will simply select some other 5,430 acres of federal public land elsewhere to own in order to fulfill a grant of land under the Alaska Native Claims Settlement Act of 1971. Previously, in an attempt to convince the Obama administration to do the exchange, KCC offered up 13,300 acres of its land and the State of Alaska tossed in another 43,093 acres of its land for what would have been a 206-acre route for a road through the refuge and wilderness. The bribe didn’t work with the Obama administration, but it wasn’t even necessary with the Trump administration. 1. There is only one exclusive procedure under ANILCA for road approval through conservation units, and it wasn’t followed. It must be noted that under ANILCA, roads can actually be built in a “conservation unit” such as a wildlife refuge or a wilderness in Alaska (building a road in a wilderness is never allowed in the lower forty-nine and is allowed in a wildlife refuge only if compatible with refuge purposes). Congress went on at length in Title XI of ANILCA to set forth the process for approving any road. Zinke just ignored those requirements. One of those requirements is that the road must further the purposes of ANILCA, which it would not. 2. The land exchange doesn’t further the purposes of ANILCA. preserve unrivaled scenic and geological values associated with natural landscapes; to provide for the maintenance of sound populations of, and habitat for, wildlife species of inestimable values . . . , including those species dependent on vast relatively undeveloped areas; to preserve in their natural state extensive unaltered arctic tundra, boreal forest, and coastal rainforest ecosystems; to protect the resources related to subsistence needs; to protect and preserve historic and archeological sites, rivers, and lands, and to preserve wilderness resource values and related recreational opportunities . . . ; and to maintain opportunities for scientific research and undisturbed ecosystems. Congress didn’t mention anything about more conveniently hauling fish to market. 3. No environmental impact statement, required by NEPA, was prepared. Under NEPA, major federal actions affecting the environment must be given a hard look with alternatives considered. Zinke ignored this provision by claiming the transfer isn’t really about a road (see above) but about a land transfer under the Alaska Native Claims Settlement Act (ANSCA) of 1971, in which Congress exempted from NEPA any ANCSA conveyances to native corporations. Zinke might have tried to rely on the EIS that Secretary Jewell had prepared (I’m sure she left him a copy on the desk), upon which she based her decision denying the road, but he did not. 4. No consultation under ESA occurred. Under ESA, Zinke should have consulted with the Fish and Wildlife Service and the National Marine Fisheries Service over two ESA-listed species: Steller’s eider (listed as threatened in 1987) and northern sea otters (listed as threatened in 2005) (Figures 2 and 3). Figure 2. 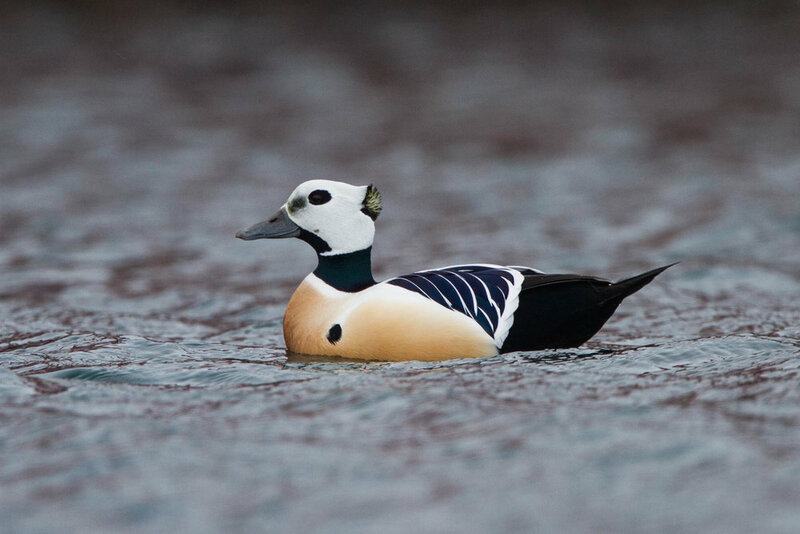 A male Steller’s eider (Polysticta stelleri). Source: Ron Knight of Seaford, East Sussex, United Kingdom, via Wikipedia. Figure 3. 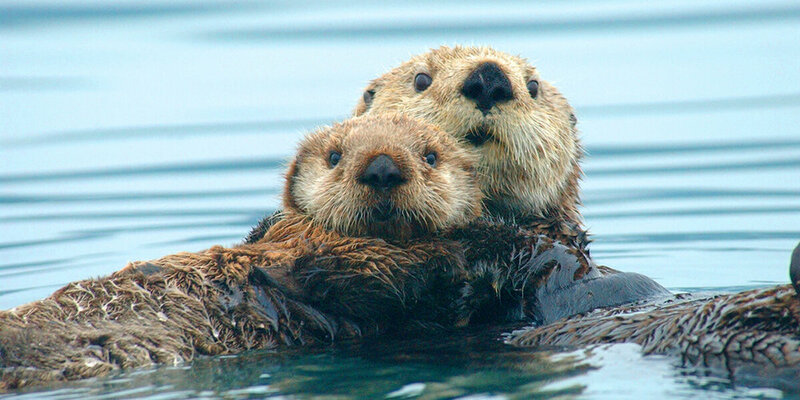 Northern sea otters (Enhydra lutris kenyoni). Source: US Marine Mammal Commission. 5. Because Zinke violated ANILCA, NEPA, and ESA, he also violated APA. The most underappreciated federal environmental protection statute is the Administrative Procedure Act (APA), first enacted into law in 1946. While not an environmental law per se, APA requires all government agencies to adhere to the Constitution, obey statutes enacted by Congress, observe procedure required by law, consider facts, and to not act in a manner that is arbitrary, capricious, an abuse of discretion, or otherwise not in accordance with law. For Izembek, Zinke failed on all counts. While elections certainly do have consequences, to the frustration of many new administration officials one cannot simply change a previously established government policy because one doesn’t like it or because the president campaigned against it. This doesn’t mean that a new administration cannot make changes. However, under APA a proposed change in policy requires a reasoned explanation and a rational basis. Rather than even attempt to explain away decades of analysis by his and other government agencies—as well as his immediate predecessor—as to why roading the Izembek is not just a bad idea and not in the public interest but also illegal, Zinke tries to just ignore it all (because it cannot be rationally explained away). Such arrogant, unjustified, and obnoxious behavior by government officials is why the Constitution provided for a judiciary with judges who have lifetime appointments. The road to defile Izembek is more about hauling profitable salmon to market than sick people to safety. Today, the processed fish from King Cove is shipped out either by boat or barge or by air. To fly the processed fish to market, it must first be loaded on a boat in King Cove and taken across Cold Bay to the city of Cold Bay dock, where it is trucked less than a mile to the Cold Bay Airport. A road from King Cove to Cold Bay would avoid the boat loading and unloading steps in the process. The Road shall be used primarily for health, safety, and quality of life purposes (including access to and from the Cold Bay Airport) and generally for noncommercial purposes. The commercial transport of fish and seafood products, except by an individual or small business, on any portion of the Road shall be prohibited. Congress didn’t intend for the road to make it more convenient for Cold Bay residents to go on holiday. As for the transport of fish, the killer term of art is “small business.” While “small business” sounds innocuous, the US Small Business Administration defines a firm engaged in “seafood product preparation and packaging” to be a small business if it has no more than 750 employees. Although it has fewer than 750 employees in King Cove, Peter Pan Seafoods is part of a seafood conglomerate with far more than 750 employees overall. It is owned by Maruha Capital Investments, Inc., a subsidiary of Maruha Nichiro Corporation in Japan, a Fortune 500 company and the largest seafood company in the world. So, no small business, right? So, no fish hauling on the refuge-trashing road, right? Wrong. All the Maruha behemoth has to do is spin off its King Cove operation into a separate corporate entity (it has numerous other ones already) and the five-hundred-worker cannery in King Cove is now a “small” business. Alternatively, it could simply contract with a small "independent" trucking company to haul its fish over the road. Game, set, match for Peter Pan Seafoods. Figure 4. Pacific black Brandt. Source: US Fish and Wildlife Service.